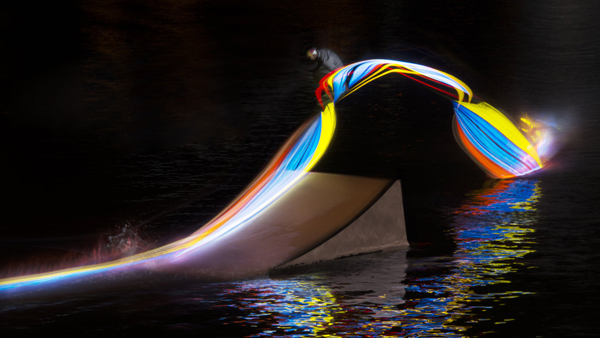 Rad new project from light painting photographer Patrick Rochon working with Red Bull Illume and SNAP Orlando, Check it out. The lengths to which photographers and athletes go to nail a shot is often extreme — especially with sights on an entry into Red Bull Illume in mind. Just a few miles down the road from the lights and magic of Disney World and Universal studios was the setting for this light-painting photo shoot at Orlando, Florida’s OWC Cable Park. Onsite were Red Bull wake riders Adam Errington, Dallas Friday and Mike Dowdy. After the park closed to the public, photographer Patrick Rochon shot the Red Bull Riders as they attacked the sliders and kickers on boards tricked out with intricate LCD lighting. Play the video above for a behind-the-scenes look at the shoot, which took place over three nights in late March. 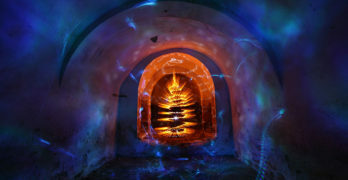 The shoot – which was done in conjunction with a local Red Bull-supported photography event called Snap! Orlando – included many challenges in preparation. It’s hard enough to shoot high-speed action in the dark – add in the tasks of outfitting the boards with the waterproof LCD light systems to staging the cameras, lighting and athletes in proper position to secure the shot, and you have yourself a serious photographic mission. Some of the most inspired by the project were the athletes themselves. “It really is my movements painting this picture and helping this photo come to life!” says Errington, the 24-year-old wakeboarder at the top of his game.